Action from Peterborough Northern Star (stripes) v Deeping in the FA Cup. Photo: Chantelle McDonald. @cmcdphotos. Deeping Rangers have already set themselves high standards for the rest of the season. The United Counties Premier Division title fancies beat a highly-rated Wisbech Town side 2-0 in their opening League fixture on Tuesday (August 8). 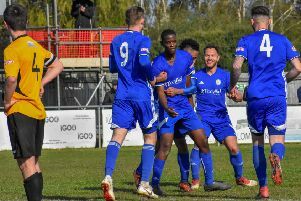 It was an outstanding all-round performance from a team keen to improve on last season’s second-placed finish and a big step-up from a 3-2 win at Peterborough Northern Star in the extra preliminary round of the FA Cup. Deeping now hit the road to take on Wellingborough Whitworth, who beat Star 5-0 on Tuesday, tomorrow (August 12) and then Yaxley next Tuesday (August 15). Yaxley are also expected to be among the title contenders. They travel to Leicester Nirvana tomorrow when Star travel to Harborough. Premier Division: Desborough Town v Wisbech Town, Harborough Town v Peterborough Northern Star, Holbeach United v Northampton ON Chenecks, Leicester Nirvana v Yaxley, Wellingborough Whitworth v Deeping Rangers. Division One: Blackstones v Rushden and Higham United, Pinchbeck United v Lutterworth Town, Potton United v Bourne Town. Division One: March Town United v Leiston Res, Wisbech St Mary v AFC Sudbury Res.